I love oatmeal, but often I find that it serves as a vehicle for sugar, even if I try to go the natural route with maple syrup or fresh fruits. 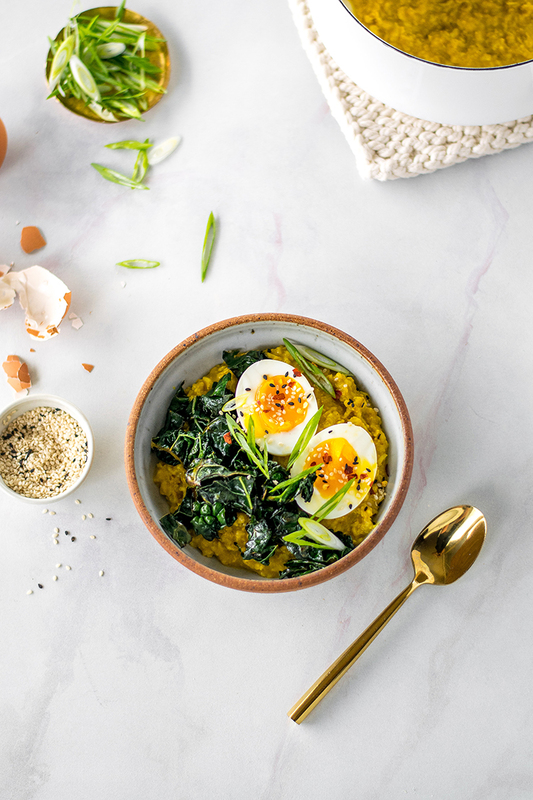 Savory oats, on the other hand, are a blank canvas for any number of delicious combinations! Today, we’re going with Japanese-inspired flavors with a few twists. 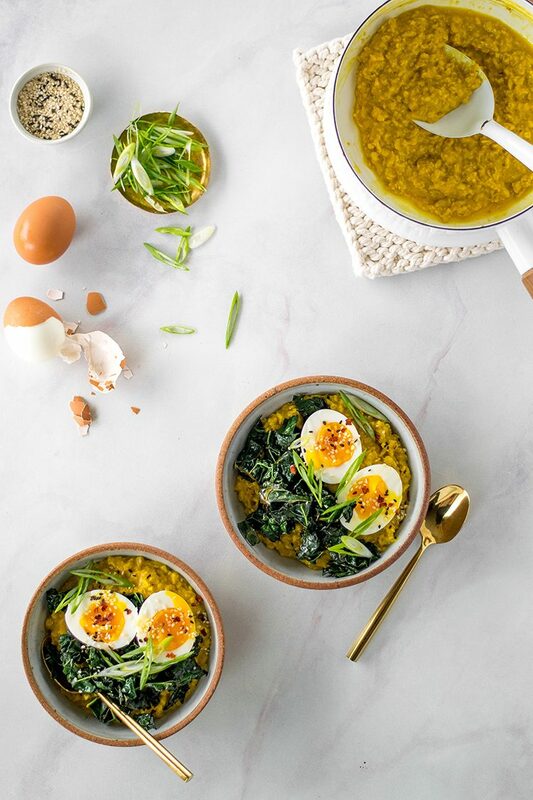 I swirled in a little salty, funky miso to add some real depth of flavor along with garlic and turmeric, a wonderful superfood to start your morning off right as it helps fight inflammation in the body. You’ll not only feel full and satiated, but be well-taken care of for the whole day. Plus, you just may feel your best! And if you can’t have miso, don’t stress. Use some tamari or soy sauce instead. I also love starting the day with some greens, too. A nice serving of sautéed kale with sesame oil for some toasty nuttiness helps to round out the bowl. If you don’t love kale, feel free to sub in spinach, chard, or any dark, leafy green you’d like. The point is to eat your greens! And no savory breakfast is complete without an egg, so I added a 7-minute egg, AKA the jammy egg. 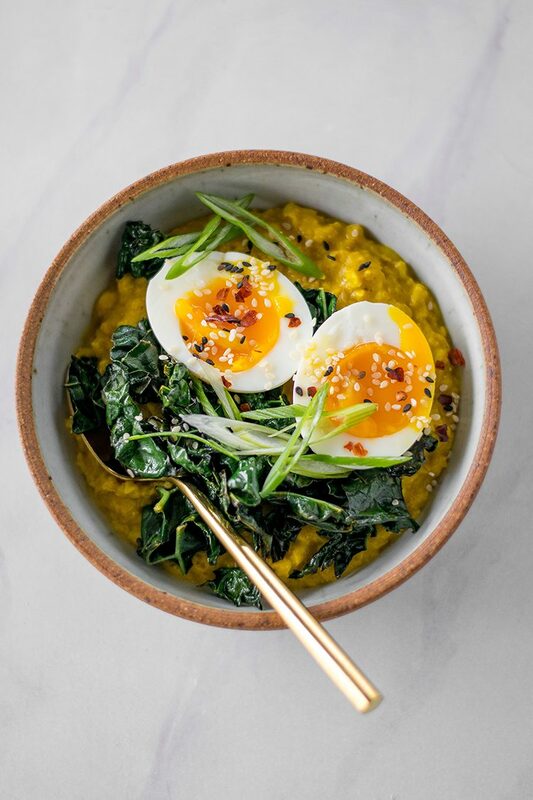 The egg is perfectly cooked, with a slightly runny and totally jammy yolk — just like the ones nestled on top of ramen bowls. Yum. The best part about this oatmeal: it comes together in like 15 minutes! Easy, right? You can even meal-prep this if you’d like. Just make a larger batch of all the components ahead of time and reheat. Then, assemble when you’re ready to eat! To make the eggs, bring a small pot of water to a boil over medium-high heat. Then, gently lower the eggs into the water using a slotted spoon. Turn the heat down to about medium so the water is just simmering. The eggs should not be boiling violently in the pot or they may crack. Cook for seven minutes. After that, scoop the eggs out with your slotted spoon and pop them into a bowl with ice and cold water. Next, let them hang out for a few minutes until they’ve cooled slightly. 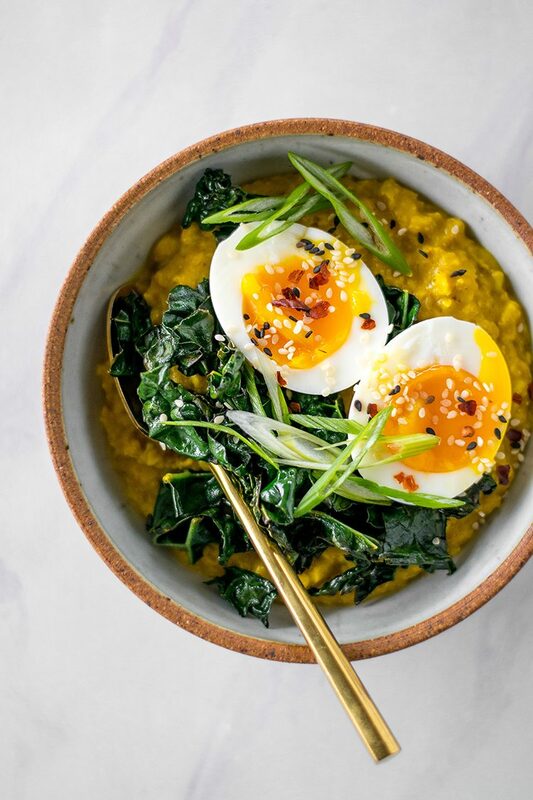 While the eggs are cooking, add the oats, water, miso, garlic, and turmeric to another medium saucepan set over medium-low heat, and allow to cook for about 7-10 minutes. Stir occasionally, until water has absorbed and oatmeal has become thick and creamy. Next, make the kale by setting a large cast-iron skillet over medium-high heat and adding in the sesame oil and then the kale. The pan should be hot enough that the kale sizzles and pops when it hits the pan. Then, stir it around and let it cook for a minute or two, until slightly wilted and starting to char and crisp up. Drizzle over the tamari or soy sauce, chili flake, and lemon juice. Stir to coat then remove from heat. To assemble, divide the oats evenly between two bowls followed by the kale. Peel the eggs and slice in half lengthwise and place two halves on top of each bowl. Finally, top each with a sprinkle of sesame seeds, more chili flake if you’d like, and scallion or chives. Enjoy and feel nourished!